The Spyderco Tri-Angle Sharpmaker Model 204MF enables even the inexperienced to achieve professional results on almost any sharpening task. 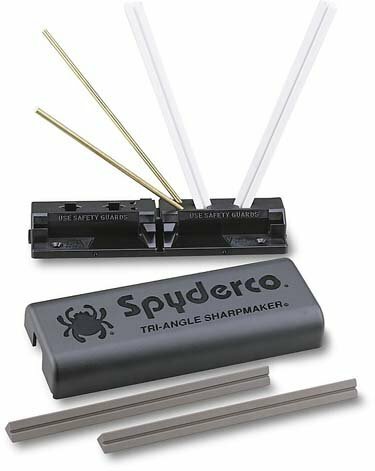 Spyderco's Tri-Angle Sharpmaker includes two sets of high Alumina Ceramic stones: A pair of medium grit dark stones for aggressive sharpening, and a pair of fine grit white stones for professional grade finishing. There is also a set of brass safety rods to protect the user's hand during sharpening. The corners of the triangular shape allow you to hone serrated edges, the flat sides ideal for plainedges. The stones fit into keyed holes and slots molded into the polymer base and have a 40 degree and 30 degree sharpening angle for knives and a 12 1/2 degree scissor setting. A groove running the length of the stone is for sharpening pointed objects like darts, awls and fishhooks. All components pack into the base and the lid snaps shut making it self contained and small enough to carry in your shirt pocket. No lubrication is required during use for dry, mess-free sharpening. Includes instruction video.